Today’s #VeteranOfTheDay is Army Veteran Clarizza Paz. Clarizza served from 2010 to 2017. Clarizza enlisted as an Army in 2010. Before enlisting, she was a manager at Chili’s and Famous Footwear and earned a Bachelor of Science in Management from DeVry University in 2007. Clarizza was assigned to 3-6 Field Artillery, 2-22 Infantry Battalion and 10th Brigade Support Battalion, 1st Brigade Combat Team based out of Fort Drum, New York. She deployed to Afghanistan with the 2-22 Infantry Battalion in 2013 and was the only female officer in the unit in charge of closing Forward Operating Base Warrior and transferring control of Combat Outpost Muqor to the Afghani Forces. She was later stationed with the 2nd Brigade Support Battalion and Headquarters, 2nd Stryker Brigade Combat Team, 2nd Infantry Division at Tacoma, Washington, where she assisted in adding nursing stations to the six battalions in preparation for the new combat arms female roles. She also volunteered to be the family readiness program manager and treasurer to the 4-25 Brigade Special Troop Battalion between January 2006 and October 2007. She earned her Master of Business Administration in Health Services Administration in 2015. Clarizza was medically retired in 2017 and since then, has been volunteering with various Veterans organizations to promote awareness for female Veterans and their service. She also started her own custom apparel and accessories to promote female Veterans based out of Bloomington, Indiana. 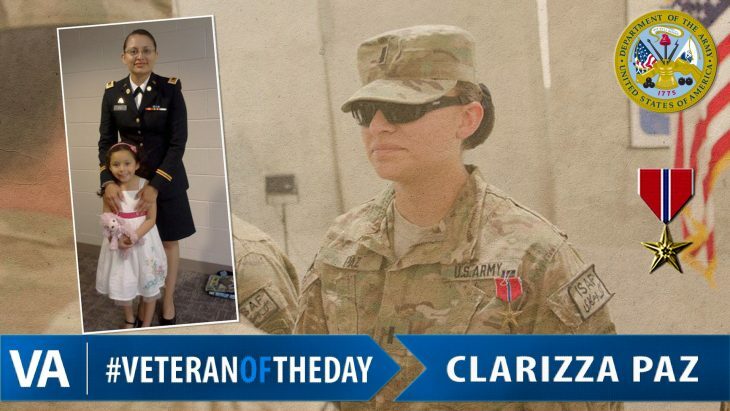 Thank you for your service, Clarizza!